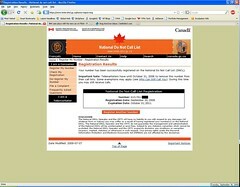 So I was finally able to sign up for Canada's brand new 'Do Not Call List'. The list is administered by Bell, and takes nothing really to sign up. You simply enter your phone number and click submit. Not too much to do really.